L'Observatori Sirià de Drets Humans ha confirmat l'arribada del contingent eslau a l'aeroport internacional de Qamixli, a Rojava (Kurdistan de Síria). Integrat per soldats i enginyers, l'equip militar té com a tasca preferencial arranjar i, fins i tot ampliar, la base aèria. Objectiu: facilitar l'arribada d'avions militars russos. El comitè de coordinació local ha quantificat en un centenar els militars russos que van arribar el 18 de gener i s'han acantonat a la base anomenada "Regiment 154" de la ciutat kurda amb un equip integrat per bateries antiaèries i radars. Donat que l'Estat Islàmic no té forces aèries es desconeix de quins avions s'ha de protegir l'aeroport. L'oposició a Al-Àssad tampoc compta amb forces aèries i és lluny de la zona. Tampoc tenen avions les SDF i l'única possibilitat "d'amenaça aèria" serien l'aviació de la coalició internacional o bé la turca. La primera no combat ni contra Rússia ni contra Àssad i la segona no ha actuat encara a Síria. El desplegament rus, segons l'agència Anadolu, es farà només a la zona de Qamixli sota control del govern sirià d'Al-Àssad. En tot cas la notícia es filtra coincidint amb el temps amb la creació d'una base nord-americana a la vora de Qamixli, a la zona rural de Rimêlan. 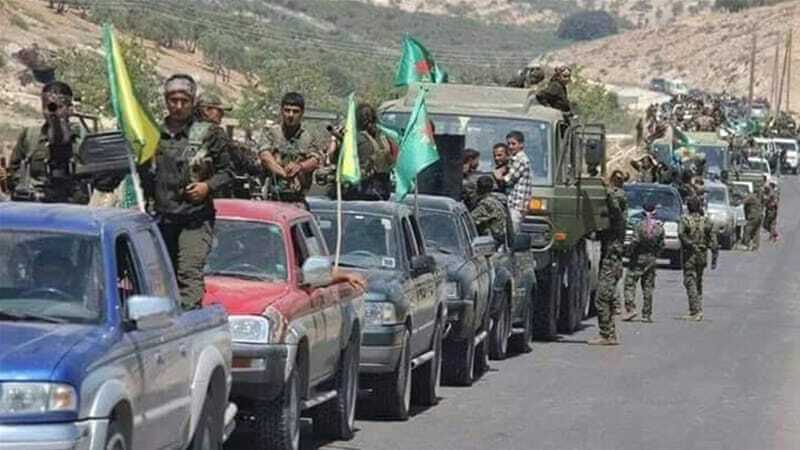 QAMISHLO, Syrian Kurdistan,— Russia has sent soldiers and engineers to the international airport in the main Kurdish city of Qamishlo (Qamishli) in Syrian Kurdistan, the Syrian Observatory for Human Rights (SOHR) has reported. In a statement quoting local activists, SOHR said Russian soldiers and engineers were dispatched to the international airport in Qamishlo in Syrian Kurdistan in order to expand the facility and enable the landing of Russian fighter jets and cargo planes. The airport would serve to enhance Russia’s defenses, the SOHR claimed. Meanwhile, the Local Coordination Committee (LCC) reported that some 100 Russian soldiers of different ranks arrived at the airport in Qamishlo on Jan. 18 with a Syrian military plane. According to the LCC’s statement, Russian soldiers were brought to Regiment 154 base in the south of Qamishlo, which is equipped with artillery batteries, radars and anti-aircraft weapons, and serves to defend the airport. Turkey’s state-run Anadolu Agency reported the Russian soldiers would be deployed to areas of Qamishlo that are under the control of the Syrian regime, and not the Kurdish Democratic Union Party PYD and its military wing of People’s Protection Units YPG. Turkish intelligence sources have confirmed to daily Hurriyet that Russian forces arrived at Qamishlo, stating Turkey’s radars had noticed the plane carrying the soldiers. The deployment is not a first, sources said, adding that Russian forces were previously spotted in parts of Qamishlo that are controlled by the regime. The number of soldiers sent to the area remains unclear, the sources explained. The reports were denied by Kurdish sources speaking to daily Hurriyet, however, which claimed all communications between Russia and the Kurdish PYD were being conducted in Moscow. Russia President Vladimir Putin said in in September 2015 no one but Assad’s forces and Kurds are fighting Islamic State. The powerful Kurdish YPG force which the US considers an ally in the fight with IS, is considered the most effective group fighting IS in Syria. The YPG militia has seized swathes of Syria from Islamic State with the help of U.S.-led strikes. Syrian Kurds declared their own autonomous Kurdish region of Syrian Kurdistan (Rojava) in November 2013. La nova instal·lació s'afegeix al desplegament, no confirmat per cap de les dues parts, però real, de mig centenar de militars nord-americans. L'arribada del contingent es va produir a finals de novembre. El portaveu de la Casa Blanca, Josh Ernst, va assegurar que realitzaven tasques de formació de combatents de les Forces Democràtiques de Síria (SDF). Les Yekîneyên Parastinê Gel (Unitats de Defensa Popular, YPG) ja van agrair l'ajuda militar amb assessors especificant que els calia, sobretot, armament. Barack Obama va decidir, a finals d'octubre, desplegar tropes per primera vegada a Síria, tot i que sempre s'hi havia negat. La base aèria, coneguda com a Basha, s'ha instal·lat a Rimêlan, al cantó autònom d'Al Jazira (Cizîrê en kurd), segons Taj Kordsh, de les SDF. "Segons l'acord amb les YPG, s'ha cedit als EUA el control de l'aeroport. L'objectiu d'aquest acord és donar suport a les SDF amb provisió d'armament i per acollir avions de guerra dels EUA. Fa dos anys que les YPG controlaven aquest aeroport. És estratègic i proper a diversos pous petroliers. L'aeroport era utilitzat amb usos agrícoles pel govern sirià." Segons Al Jazeera, la coalició internacional coordinada pel Centcom, no ha confirmat els fets. L'Observatori Sirià de Drets Humans sí ha confirmat el control nord-americà de la base. Aquesta permetrà incrementar l'operatiu aeri de suport a les SDF contra l'Estat Islàmic doncs, en un temps mínim, podran sobrevolar els fronts de Manbij, Sarrin, Ayn Issa o al-Hasakah. Correction: An earlier version of this story eroneously showed a photo the Prince Sultan airbase in Saudi Arabia instead of the Rmeilan airfield in Syria. US troops have taken control of Rmeilan airfield in Syria's northern province of Hasakah to support Kurdish fighters against the Islamic State of Iraq and the Levant (ISIL), a spokesperson for the Syrian Democratic Forces (SDF) told Al Jazeera. The airfield near the city of Rmeilan, which will become the first US-controlled airbase in Syria, was previously controlled by the US-backed Kurdish People's Protection Units (YPG). The airfield is close to Syria's borders with Iraq and Turkey. "Under a deal with the YPG, the US was given control of the airport. The purpose of this deal is to back up the SDF, by providing weapons and an airbase for US warplanes," Taj Kordsh, a media activist from the SDF told Al Jazeera on Tuesday. "This airport was previously controlled by the YPG for over two years now. This strategic airport is close to several oil bases - one of the biggest in this area. "Rmeilan airport was previously used for agricultural purposes by the Syrian government," he said. Previous reports published by the Syrian Local Coordination Committees say that the US has been preparing and expanding Rmeilan airport for a while now. When asked by Al Jazeera, a US CENTCOM media operations officer did not confirm or deny the reports. The US has previously supplied the SDF with weapons. It also backs the group with its air strikes in their fight against (ISIL) in northern Syria. The SDF was founded in Syria's mainly Kurdish northeastern region in October 2015, and is made up of at least 15 armed factions - mostly fighters from the YPG and the Free Syrian Army. The fighters include Christians, Arabs and about 500 foreign fighters, Kordsh said, adding that some groups in Aleppo and Idlib pledged allegiance to the SDF last month. The UK-based Syrian Observatory for Human Rights monitor also reported on Tuesday that the US had taken control of the airbase. Sourcing activists, the Observatory said the airfield is still being prepared for use by the US.